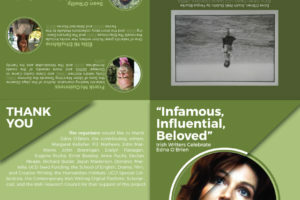 Join Frank McGuinness, Éilís Ní Dhuibhne, Sean O’Reilly, Danielle McLaughlin, and Louise Nealon as they read and respond to the work of Ireland’s greatest living novelist. Date and Location: Monday September 17th at 7pm in the Fitzgerald Chamber, UCD Student Centre (Enter from Clonskeagh Road: a visitor car park is located near the roundabout; Student Centre is the second building on the left after the roundabout). To book your free ticket go to the Eventbrite page and register: https://tinyurl.com/Obrienfest.